The random orbital buffer may not be the place to start despite what you read. As a rule when the subject of car buffers comes up, the random orbital buffer is widely accepted as the type of buffer being discussed or referred to. Also known as DA or dual-action buffers, these important tools of the trade have long been referred to as the ultimate in safe car polishing for any true beginner. While I largely agree with this rule, it has changed due to the newly designed automotive polishers with super-low start speeds that make the high-speed polishers as safe as any random orbital buffer. If you are on the fence as to what to do, where to go, and which type of car buffer to buy, you are not alone and you have indeed come to the right place! "Darren, I find myself chasing my tail trying to figure out the best car buffer for me. The many car forums are filled with endless opinions and I can't seem to make a decision!" Trust me when I say choosing the best random orbital buffer is not an easy choice for most people; far too many opinions from too many people. Never mind an industry that is constantly adding more and more choices to an already complicated subject. Those who want a simple, direct answer based on professional experience so you can get down to business of polishing your car and then get on with your life. Those that really like to sink their teeth into greater depths of understanding before making a decision. One of the actual random orbital polishers I use professionally. A kit that contains everything 95% of you will ever need to polish your own car. "Griot's Garage has been putting out professional and enthusiast grade tools and products for decades. 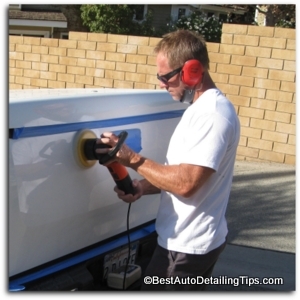 Not only can I guarantee that this will be the perfect car polisher for any beginner and is as safe as safe can get, but will likely be the last car polisher you will ever need." Today is a world of information overload. And most of you are not equipped to deal with so much information, never mind the slick marketing and advertising that goes with it. 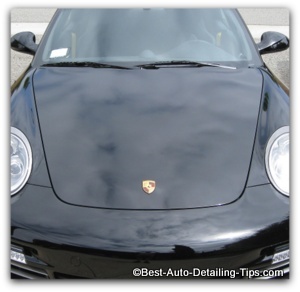 The fact that you are so interested in taking your car's appearance to the next level by choosing a top rated car polisher makes you even more susceptible to the seductive nature of slick marketing and advertising! 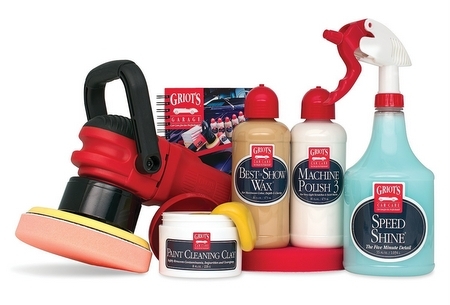 For this reason I have reduced this difficult decision process into this simple all-inclusive kit from Griot's, along with the fact that it is the actual car polisher I use professionally. Truly the last random orbital buffer you will ever need if you decide to go with this model. From absolute beginner to seasoned paint correction specialist. 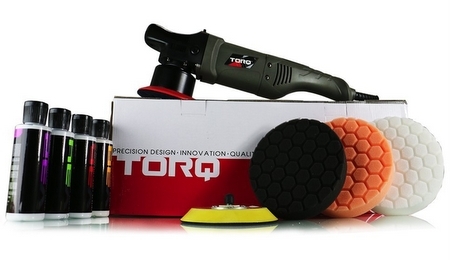 The torq car polisher in many ways represents the perfect balance betwen performance and cost. You will definitely get better performance from the Torq over that of the Griot's, but you will also get a better user experience. Unlike some of the other offerings with random orbital buffers, you won't be over-paying for a "name brand" polisher that has a premium due to the "clout" that some of the other polishers can add a surcharge for. This kit contains everything needed to polish your car to a level that will make you the envy of the neighborhood! 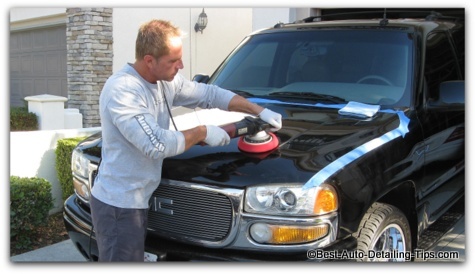 (you will still need to shop a clay bar kit to decontaminate your paint prior to any polishing for maximum results). The huge amount of rave reviews on Amazon should be compelling enough for you when choosing the Torq random orbital buffer! Thank you for visiting random orbital buffer review! I bet you know of at least one other person who could benefit from the information I have taken the time to lay out here on the pages of this website. This could be your family, friends, car forum, car club, or any of your social networks you are part of. Spreading the word helps me just as I have hopefully helped you!